We’re back. Special thanks to anyone who sent concerns either through email or comments. 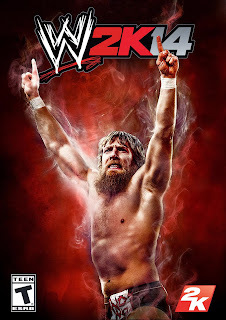 While I was pretty busy last week I did manage to spend some more time with WWE 2K14. I talked about picking the game up last month but I just finally got a chance to really start playing it the way I wanted to. The game lets you create your own Universe by creating shows, PPVs, belts, arenas, and wrestlers. While in years past I would play shows mostly dominated by my own creations they were still made up of about 50% real wrestlers. This year I wanted to really tell my own story. So I created an army of fake wrestlers. When I realized that just the characters I normally create weren’t going to be enough I started throwing together quick characters to fill the gaps. I created brand new arenas and belts for my champions to hold. I spent hours modifying move sets or tweaking character entrances. Finally I was to a point where I’d be able to actually play the game. I still had some changes to make, but I could start my Universe. As my shows neared the end of the month we were headed to the first PPV and the first big title matches. And then my game froze. My first PPV had three championship matches on the card. I tried all three of them and would end up locked up or in an infinite loading loop. Hours and hours had already been put into this and now I might have to redo a huge portion of it to add normal belts. I wasn’t happy. I ran to the internet for help. I disabled entrances and replays. I installed the game to my harddrive. Anytime I tried to play the title match in Universe for a custom belt the game would freeze. While experimenting with the Universe mode I found my own workaround. When viewing the card in Universe mode go to the title match you want to play. When you press edit to change the match you will be given two different options. One is to change the match completely and the other is to just change the participants in the match. For this you want to pick “change the participants”. You’ll get another warning message that says if you change the people involved in the match it will no longer be a championship match. At the character select screen the two wrestlers who were scheduled to wrestle should already be selected. Click accept and you should be able to play the match. It’s entirely possible that this won’t work for you, the game is pretty damn buggy, but I’ve been able to play 3 different title matches because of this trick.